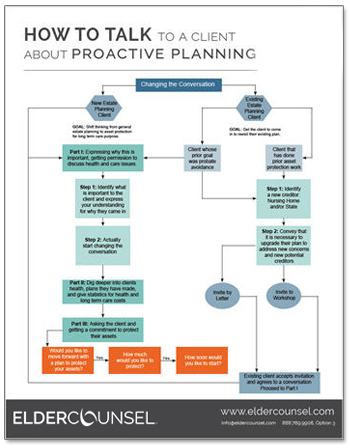 Flowchart on how to talk to clients about the need to plan now to protect assets. This is a step-by-step guide on how to talk to existing or new clients about the need to plan now to protect assets in the event the client or the client’s love one has a health care crisis. This is one sample of the benefits we offer our members. Members even have a script to accompany this guide! Enter your information below to receive this free whitepaper today.